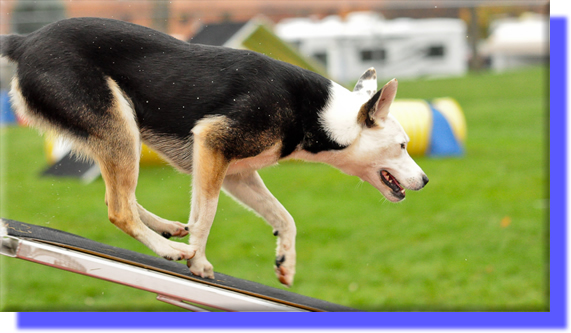 North American Dog Agility Council - offers agility for all dogs. United States Dog Agility Association - offers agility for all dogs. United Kennel Club - offers agility, obedience, rally, dock diving, weight pull, and more, for all dogs. Mixed breed dogs must be spayed or neutered and must have an LP number to participate. Australian Shepherd Club of America - offers agility and obedience for all dogs. Offers herding to all herding breeds and mixes of herding breeds. American Herding Breed Association - offers herding for all herding breeds and mixes of herding breeds. American Mixed Breed Obedience Registration - offers titling in agility, obedience, and other sports, for mixed breed dogs and non-AKC/UKC recognized rare breeds. American Kennel Club - offers agility, obedience, rally, tracking, Canine Good Citizen testing, and more, for all dogs. Mixed breed dogs must be spayed or neutered to particiapate. Canine Performance Events, Inc. - CPE offers agility for all dogs. Googility - Find agility clubs and resources with this agility search engine. Pound Pals of Radford, Inc. - The rescue organization that saved Lucas. Partnership for Animal Welfare (PAW) - the rescue organization that saved Zeus. PetFinder - A great resource if you are looking to adopt a new dog or puppy! Blue Ridge Border Collie Rescue - the rescue organization that saved Brie's littermates. Lake Norman Animal Rescue - the rescue organization that saved Pye. A Forever Home Rescue Foundation - the rescue that saved Audie and his mom and littermates. NRV Animal Shelters Online - A listing of links to local animal shelters and rescues. A great place to look for your next agility dog!